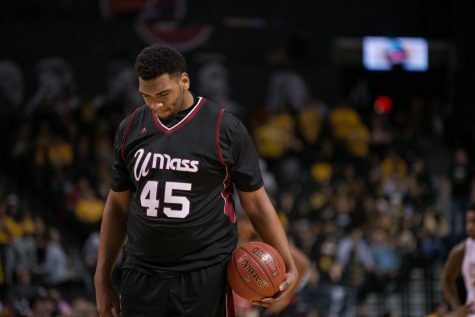 The Massachusetts men’s basketball team enters into the 2010-11 season with a rebuilt roster after losing top scorer Ricky Harris. 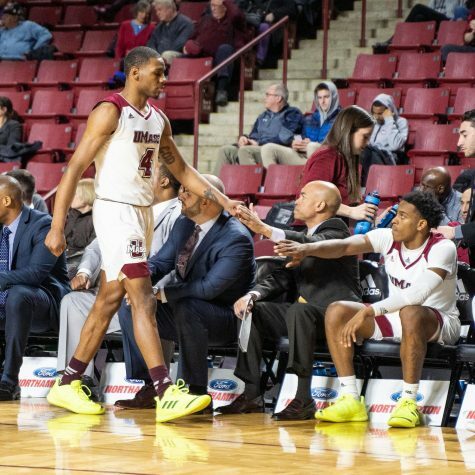 From the guards all the way down to their center, the Minutemen are filled with a packed roster constantly looking to break from the bench to the starting lineup. 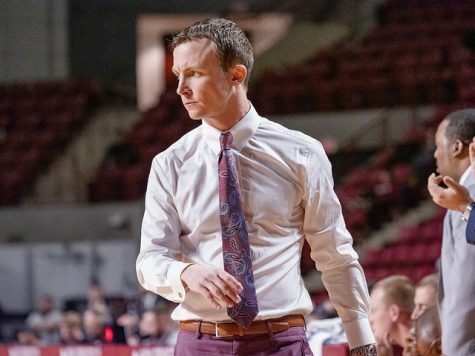 For UMass coach Derek Kellogg and Co., the lineup isn’t overwhelmed with players either, as each competitor has a role to fill for the Maroon and White, who will look to build off last season’s bid to the Atlantic 10 postseason. If there is one thing Kellogg isn’t worried about this season, it’s the way the offense, particularly its guards, will perform. The guards include one of the team’s top players, who will take a leadership role this season after the loss of Harris, in Anthony Gurley. While Gurley averaged 13.6 points per game last season coming off the bench, his scoring as a starter has not weakened at all, as he had a career-high 31 points in the home opener against Rider. Gurley aided a 22-point comeback which spanned 16 minutes. “I have a better feel for Anthony, where he’s going to be successful,” Kellogg said. Though Gurley is the most notable of the guards, Gary Correia and Daryl Traynham are two strong point guards who are both battling for possession of a starting spot in the lineup. 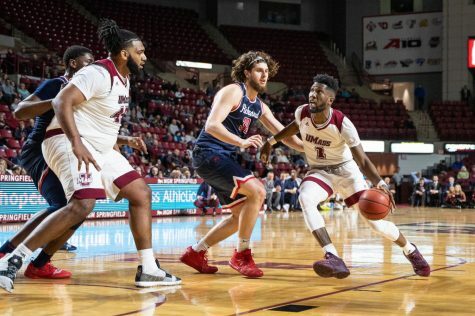 As a starter, Correia had one point in the season opener against Rider from a free throw shot, enough to best Traynham, who did not score despite two shots, though he did earn seven assists. His defense was present however, as Traynham nabbed two steals. One role Traynham played during his off-the-bench performance against Brandeis in the preseason was hound the ball and apply pressure defensively. Though for Kellogg, the defensive roles of the guards isn’t enough to keep the team strong on the other end of the court. 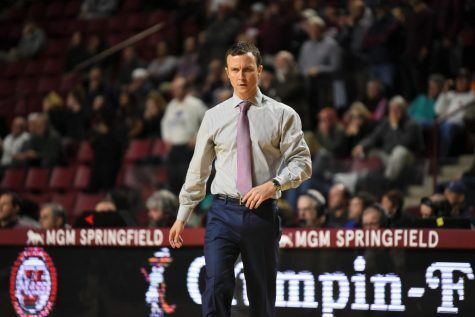 “I think the goal for every coach is they don’t score, they don’t make the dribble, they don’t get a rebound, which is impossible to have happen but that’s the goal,” Kellogg said. 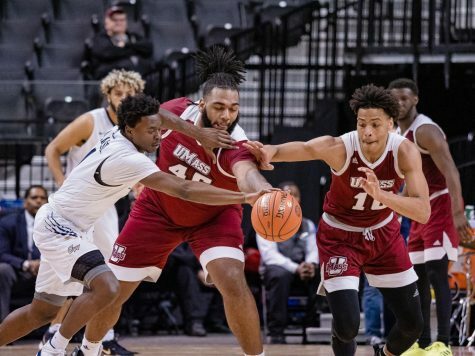 While Traynham and the other top guards will look to beter their defensive game, the scoring for UMass comes in many sizes and packages, including Freddie Riley. 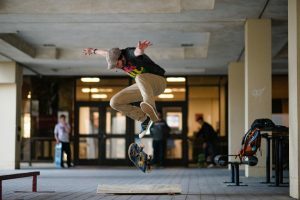 Riley will look to improve on his blooming collegiate career. 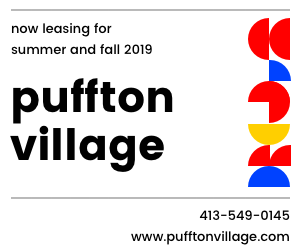 His shot selection could be called into question this season, as he shot 38.2 percent from the field last season and 38 percent from downtown. However, Riley might have silenced his critics in the home opener, as he dominated on offense, with a career-high 28-point performance. Filling out the rest of the guards are Jesse Morgan, walk-on Jordan Couture and Chaz Williams. Williams, a transfer from Hofstra, has been ruled out for the season because of NCAA transfer rules. Moving down the lineup are the forwards, which look to be one of the more exciting sections of the court for the Maroon and White. Vinson returns after putting up 9.6 points per game last season, while dishing out 29 assists on the campaign. Vinson is taking on a new leadership role along with fellow forward Matt Hill. “I know Terrell Vinson in the mid-to-low post will do much better than out in the perimeter,” Kellogg said. Hill’s leadership position came to light during the opener against Rider. The junior forward nabbed three boards and dished out an assist in 14 minutes. Sampson Carter and Raphiael Putney both return to the lineup after their freshman seasons. Putney, who Kellogg praises for gaining a bit of muscle and build, put on a show in the game against the Judges, connecting for two alley-oop dunks. 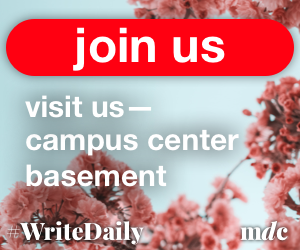 Meanwhile, Carter returns with his 4.3 points per game and 3.4 rebounds from last season fresh in his mind, and will look to build upon that, as fellow forwards such as Maxie Esho and Trey Land look to impress as they battle for position. 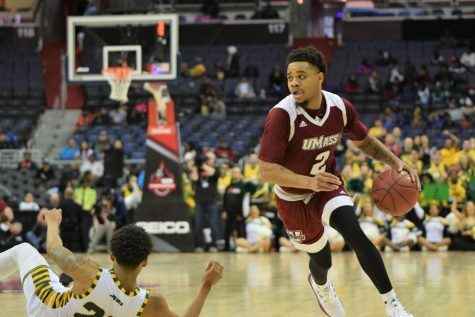 Javorn Farrell, another forward, is currently out with an injury, but his return could add some spark to the UMass lineup due to his hustle and versatility at the guard position. 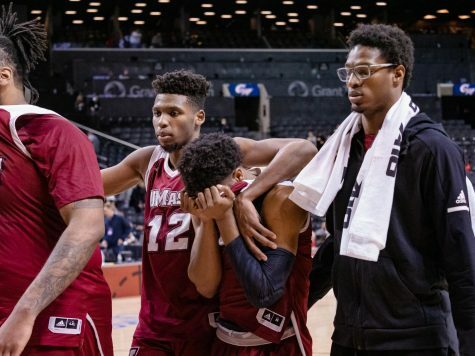 Kellogg didn’t call the combination of Hashim ‘Big Bodega’ Bailey, Sean Carter and Andrew McCarthy a three-headed monster for nothing. 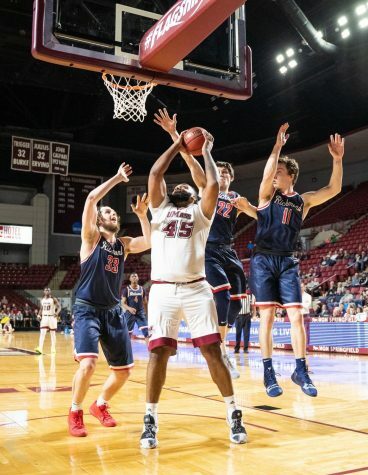 Carter has earned the starting spot for the Minutemen in their first few games, and there’s a reason for it, as he grabbed six rebounds against Rider. As the life of the team off the court, on the court Bailey will look to use his explosive energy to throw a little spice into play. His nine points against Rider complimented his seven rebounds. Carter’s position as the starting center looks to be in place for the moment, with him earning the best performance out of the three centers. Carter isn’t the only big man opponents should look out for. Bailey returns to the Minutemen with not only a new nickname (he was previously referred to as ‘Big City’ for his size) in ‘Big Bodega,’ but an entirely new look, as the center lost over 30 pounds during the off-season. Having dropped the weight and increased maturity, Bailey will look to build off his meager stats (2.5 points, 4.7 points) from last season. The rebuilt Bailey did little in the home opener, missing his one shot in five minutes. McCarthy can’t be forgotten either, as his seven-foot height clearly makes him a bulky defender. 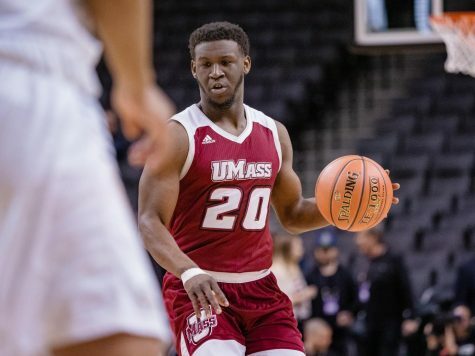 Though McCarthy is new to the Minutemen as a freshman, his height and rebounding ability can’t be too far from Kellogg’s mind. Even though Kellogg is looking for the guards to do most of the scoring, he hasn’t totally thrown away the idea of the three-headed monster putting in some numbers. “Maybe one of the big guys surprises us and has a good output,” Kellogg said. Whether it’s the big guys or the others in the lineup, Kellogg’s team may have what it takes to make a push back into the playoffs and even further.